Championship, and dozens of others. business, we’re not afraid to have fun (maybe a little too much at times). Whether taking Grand Championships or top finishes, in some of the biggest BBQ contest in the world, we guarantee the Smokin’ Elvises Competition BBQ team are always first in SHOWMANSHIP! To experience the Smokin’ Elvises showmanship and award winning BBQ first hand, check out our Team Tales page for our next competition! 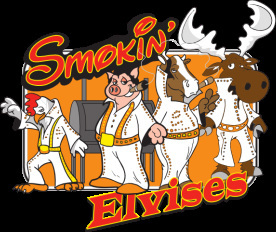 You can also drop us a line via our contact page, to learn more about having the Smokin’ Elvises cater your next event.